What Does the Derek Sheely Case Foreshadow? Inherent risks, of life and sport, are a constant issue none more controversial than concussions. 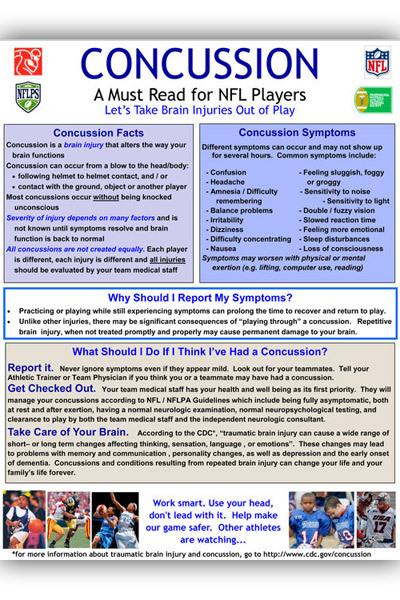 The truth of the matter is that concussions will occur in life without sports so playing: hockey, lacrosse, basketball, baseball, water polo or any sport comes with differing amount of risks/chances of concussion. By playing those sports we should understand those risks and be willing to accept the chances of injury, particularly concussion. As we have stated close to eleventybillion times now; the actual injury of concussion is not the issue of this crisis, rather it is the mismanagement of the injury that is the problem. In other words it’s not the sports fault for concussions, it the people’s fault for not taking this brain injury serious. Even worse, it is people in positions of power that have caused many to be “mishandled” after injury, bringing us to where we are today. “You expect a pristine brain. I saw a brain that was riddled with tau proteins. I was stunned at how similar that brain was to the boxers who lived into their 70s,” she said. Tau proteins are the same type of proteins found in brains of Alzheimer’s patients. We have also highlighted the tragic story of Nathan Stiles here. Remember to set you DVR if you are looking for more insight into this issue. (Thanks MS for the email). If you have read the blog much you will find a fair amount of information and commentary from Matt Chaney regarding his position on head/brain injury. One thing that Matt does well, from his journalistic background, is document the many cases of catastrophic injury related to football in America. Chaney is not the only one who does this, he just appears to be more transparent about it than the national foundation for such tracking, the National Center for Catastrophic Sport Injury Research (NCCSI). In his most recent post on his blog, Chaney gives us the list he has compiled for 2011, both by the NCCSI criteria and his extended criteria (which deserves credit). Now stronger accounting is assured for 2011, standing on results of my daily searching of Google banks that’s garnered a solid 70 survivor cases for verification as catastrophic football injuries, defined by the NCCSI as affecting the brain, skull, spinal cord and/or vertebral column. In the news just this weekend was the terrible news from Upstate New York, as Ridge Barden of Phoenix High School died due to head trauma suffered in a game on Friday. This type of news rarely escapes the “lights” of the media, in fact Sports Illustrated picked up on this case recently. 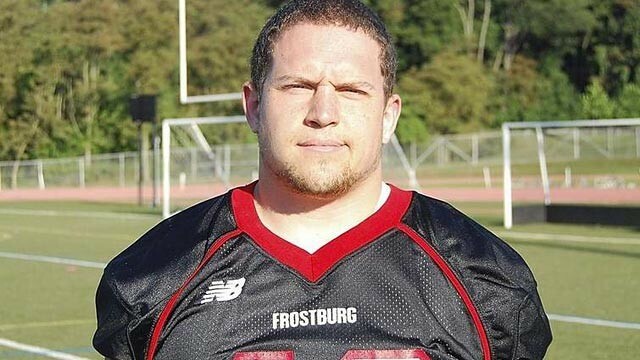 Derek Sheely’s death certificate states he died Aug. 28 of a traumatic brain injury as a result of helmet collision, almost one week after he collapsed at practice, said Kenneth Sheely of Germantown. Welcome to the continually updated live feed from the Athletic Trainers Society of New Jersey 2nd Annual Concussion Summit. I would like to thank the ATSNJ in particular; John Furtado, Eric Nussbaum, and Mary Jane Rogers for the help in getting things set up. We are at the Wyndham Princeton Forrestal Conference Center & Hotel in a stunning amphitheater, attendance is anticipated to be high. I anticipate updating this post as soon as possible after each speaker. Follow @concussionblog for updates. 6:25am CST: Crowd flowing in with provided breakfast in hand. Matt Chaney is a journalist, editor, teacher and publisher, and he too has a blog that is just getting up and going. However, Chaney has published a book titled Spiral of Denial; Muscle Doping in American Football, so he is not new to finding and presenting good information. As a foremost authority on sport doping, Pennsylvania epidemiologist Charles E. Yesalis identifies a public health problem of longstanding: athletes’ use of anabolic steroids, stimulants and more drugs that permeate amateur and pro ranks. But Yesalis, professor emeritus of health policy at Penn State, sees a larger issue rearing now, brain trauma, to threaten all contact sports and particularly American football. You can read more on this by clicking HERE. In the entire post you will see how the Nathan Stiles case was viewed by Dr. Robert Cantu, a renowned neurologist of Boston University and the Sports Legacy Institute. Cantu does not completely believe the medical examiners report of an undiagnosed or missed subdural hematoma. Thank you for the email and story Matt! A promising young athlete struck down in the prime of his life, at his own hands. Brad Evans of Hobbton High School in North Carolina ended his life with a gunshot. A seemingly “put together” young man who had no indication of depression or impulse control issues suddenly and without explanation felt compelled to end it. Brad was going to go to college to play baseball and possibly strive for his ultimate goal of the Major Leagues. This was to happen after his senior season, including on the gridiron, where all the problems may have begun. It is very important to say that there is and most likely will not be a link, but Brad suffered three concussion in a month’s time. He returned prematurely, and did not get a doctor’s clearance to participate. His final concussion occurred on October 8th and required a helicopter transport to a regional medical center. The time line and a very good narrative of what happened to this young man are at the FayObserver.com, written by Greg Barnes. 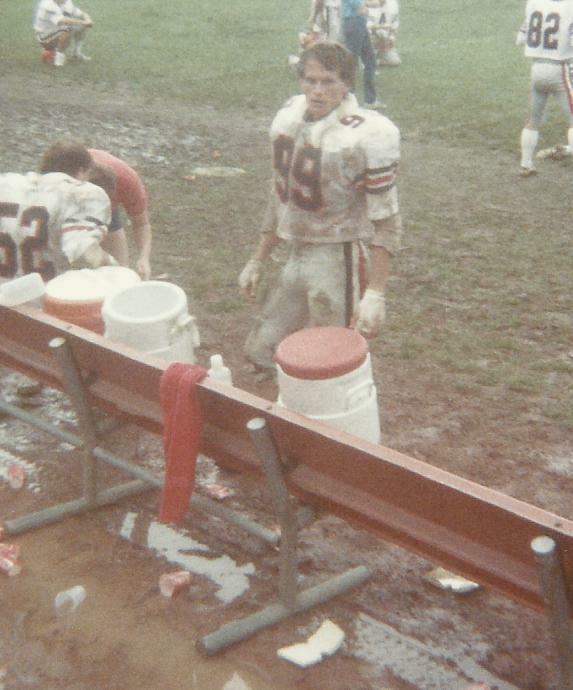 No one will ever know whether Brad suffered from CTE, or whether the repeated blows to his head altered his thinking and led him to take his own life. Suicide remains one of the most common causes of death among teenagers. But a mounting body of evidence – reinforced by the unlikely deaths of three promising young athletes since April – suggests that at least some of those suicides could be linked to repeated hits to the head. Fred Mueller has been running the National Center for Catastrophic Injury Research in North Carolina for three decades, as Alan Schwarz writes on Ocala.com. Finding information about injuries has become easier throughout the year with the invention of the world-wide web. Before that the Center had to hire news reading services to find what he was looking for. Now with the awareness after a horrible event, some even call Fred Mueller. Not only did Alan Schwarz once again explain a part of the process that someone is doing, he shed light on things that may be missing in the recent concussion discussions. Fred Mueller has written a book, it will be out very shortly, titled Football Fatalities and Catastrophic Injuries 1931-2008. As that book goes to press, Mueller continues to take his phone calls and scours the Web alongside file cabinets that read “Football Fatality Reports” and “Cat. Cases,” short for catastrophic. He seeks the stories nobody wants to hear, the most gruesome job in sports. I know we usually focus on the concussions and head injuries in sports, however head injuries, especially those that go unchecked can create very dire situations as well. According to the Belleville News-Democrat (Illinois), a 42 year-old man shot and killed his wife before fleeing and taking his own life. It all may have started with a head injury from a car crash that led to a personality change in the man, police said. If the police are saying that, this early in the investigation there may be something there. The key point of this part of the story is the “personality changes” as it related to post head injury. As we have seen with research into CTE, former high-profile athletes have also had similar anecdotes prior to their deaths (Andre Waters, Chris Benoit come to mind). Sports can be our vehicle to take steps to stop this kind of stuff. Nathan Stiles of Spring Hill High School died Thursday night after a football game. Jim Sullinger and Brad Cooper of the Kansas City Star reported on this tragic incident yesterday. According to his father Nathan had a concussion during his homecoming game but did not note any significant hits during the game. This could be the first direct football death nationwide this year, said Fred Mueller, director of the National Center for Catastrophic Injury Research at the University or North Carolina Chapel Hill. McAvoy, through the REAP initiative, seeks to make sure athletes fully recover from a concussion before returning to play. If not, the consequences can be devastating. Jake Snakenberg, unlike Camden, never got a second chance. 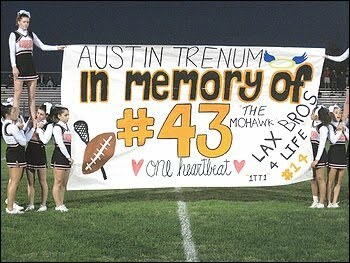 Snakenberg, a freshman football player at Grandview, died from Second Impact Syndrome after suffering two concussions in a one-week span in September 2004. Ryan Casey of the Denver Post wrote a story about the impact of concussions beyond sports in today’s edition. Unable to focus, Courtney was pulled out of school. She started sleeping up to 20 hours a day. She started losing things. Five days after her concussion, the migraines started. Mother’s Day came and went. Other symptoms — the lethargy, the forgetfulness, the inability to concentrate — grew worse. do what was asked of her, physically or mentally,” Joellen said. “All of a sudden, there was like nothing. I used to say it was like looking into her, and it was hollow. And I’m like, ‘Who is this?’ “Ten days after the concussion diagnosis, the family visited The Children’s Hospital in Littleton, where Courtney was put through a series of cognitive examinations, including a standard test during which she was told three words to remember and asked to recall them after a five- or 10-minute conversation. Pat Graham penned a story for the AP today about the Sports Legacy Institute and its ongoing contribution to the “concussion crisis” we are facing. Interviewed in the story were various professional sports athletes, as well as Chris Nowinski the Director of the SLI. The point of the story was to shed light on the fact the 300+ people are dedicating their “brains” to the research of it all. Not only will these people donate their brains after a long life, they are undergoing annual testing for data collection. Follow this JUMP to read the entire article. Here is a video from Outside The Lines on ESPN, about CTE. Also appearing in the story is local athletic trainer John Storsved of Unity High School.